P R was born in a bilingual parentage in 1951. Although his father was a science teacher and headmaster of government higher secondary schools in Tamilnadu, his mother taught him all subjects viz. English, Tamil, Hindi, Maths, Science up to his high school level. She did this by making use of household items as teaching aids, "I would not have known that a kitchen is the most wonderful laboratory otherwise." After completing his first class BSc Degree with Physics as major subject followed by BEd degree from the Univ. of Madras, he entered teaching. 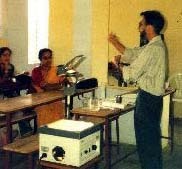 He taught English, Maths, Science, Physics and Chemistry in schools in India, Bhutan, Ethiopia, Botswana and South Africa. His spare time interests continue to be reading, watching TV, browsing the educational Net, photography, music (softrock, classical and country music), sci-fi films (some of which he has used in his teaching), dxing (he used to contribute to a British monthly Short Wave Magazine for a few years in the 80s when he had more free time. He enjoys travelling, modern art and any melodious music. P R works as Education Officer in Macmillan India Limited. His career responsibilities include conducting teacher development workshops in Science and Maths, offering editorial assistance and developing curricular support materials. His areas of interests are: Activity Based Approach in Maths and Science in the Primary and Middle School Classroom, Problem Based Learning at the Senior School Science Classroom and Computers in Educational Administration. He has a particular interest in developing curricular materials which can take textbook concepts to the children's day to day world, thereby toning up their 'concept application' skills. He firmly believes that Activity Based Approaches help children and teachers (sometimes even the parents back home) not only pedagogically but also psychologically. Mathematics is generally felt to be a difficult school subject in South Asia. The center of gravity of the problem lies in the teaching learning interaction within the classroom. Teacher: Where is the dot in the fig.? Pupils: Somewhere at the top left hand corner, sir. Teacher: Fine, you said that the dot is somewhere at the top left hand corner...is it a very accurate way of locating the dot? Teacher: Can you think of any method in which you can locate the dot in a more accurate manner? Teacher: Okay, let us see whether we can try some other technique. [Grid not drawn to scale]. Teacher: Where is the dot now? [I would prefer calling my interaction with children as 'question-answer' session to 'discussion' as it is more structured]. Many pupils seemed to be baffled immediately after this question from me; hence, to ease their discomfort, I decided to just show them a page from their Atlas, which they would have used in their Geography lessons to locate places; once I did this, pupils caught the idea [Eureka!]. Teacher: Well, tell me, where is our dot, now? Pupils: In the box B3, sir. The above method was repeated for several points (one point for each pupil) located in the grid; my children were thoroughly excited to discover that maths too can be fun! I placed a transparency as shown in fig.3 and guided the children through similar structured questioning to plot points in the grid. In this phase I had assigned +ve and -ve signs for obvious reasons. As I did this, I had tried to enable children appreciate that this type of locating points is 'just' one step further. I think that this gave them some confidence and led to self esteem [though indirectly]. [Most often children dread maths because 'relationship' aspects are not given importance in classroom interactional processes]. Once the children were familiar with locating points in a fun way, I was able to introduce Graph as laid down in the syllabus, with much ease, as after all, what I needed was to convince them that graphs are 'just' one step more than just the above phases, viz. using two axes [x and y] instead of numbers and alphabets for the two directions. The rest of my story is obvious. Most important advantages of the above approach is that 'children' run the show and that the process begins from something interesting and fun. is dedicated to discussions among math educators. The Teachers.Net community specializes in teacher peer support, bookmark the Math Teachers ChatBoard and join the Math Mailring and collaborate with your peers around the globe.